The design phase is the first phase in the fashion life cycle and one of the most important, since a correct prediction of market tastes and trends is fundamental when it comes to selling clothing collections. It is a long phase, which begins well in advance of the sale of garments and in which many people contribute: designers (internal, freelance or specialized companies), pattern making team, suppliers, and others. To be successful in this phase, brands need to have agile communication between all these people, wherever they are, and equip them with the tools that allow them to work in a coordinated, mobile way; and with access to real time information updates. The way to achieve this is through an online system integrated with the brand’s ERP, which allows all the people involved to have access the technical files that correspond to each design. Continually keep a corporate control regarding the changes made by each person and the access permissions to each file or section. The designers have online and multi-device access to the technical files of each model, in which they can share their work and communicate with each other, with the brand, and with other departments involved in the design. The information is continually updated in real time, saving many trips, calls or unnecessary e-mails. The brand has total flexibility to configure the access permission to technical files, where the works related to the design of the garments are shared. In this way, the brand can control what can be seen or modified by each user participating in the design process. Every change that occurs through the design process is recorded in the system, allowing the brand to have absolute control over the design process and able to analyse the performance of personnel, whether internal or subcontracted, in this area. 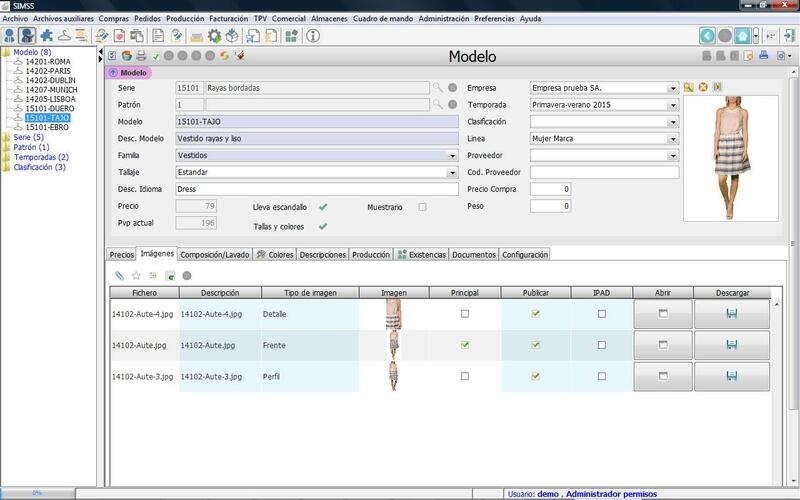 The information contained in the technical sheet is integrated in real time with the ERP of the brand, allowing data related to the design to be shared with other areas where useful, such as purchases, production or accounting.